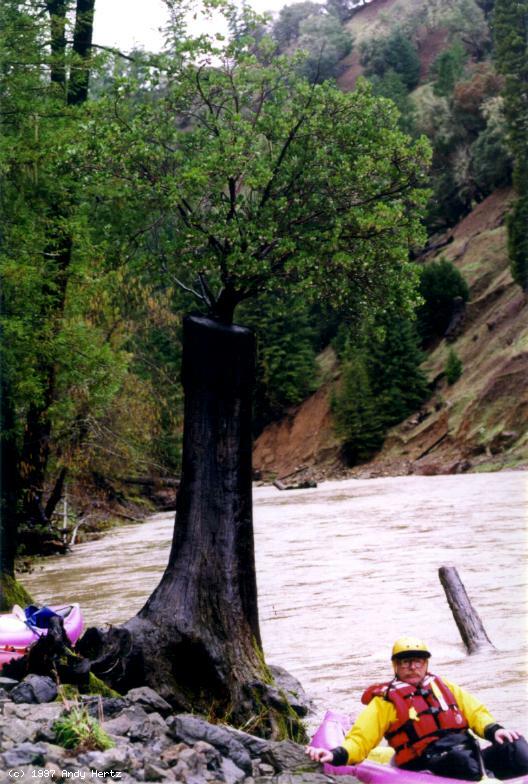 The Navarro River is formed when Indian, Anderson, and Rancheria creeks come together near the town of Philo California. Of these three tributaries, Rancheria Creek is by far the longest and largest. It flows more than 35 miles from its headwaters near Yorkville to its confluence near Philo. Surprisingly, only three public roads cross it in that distance. 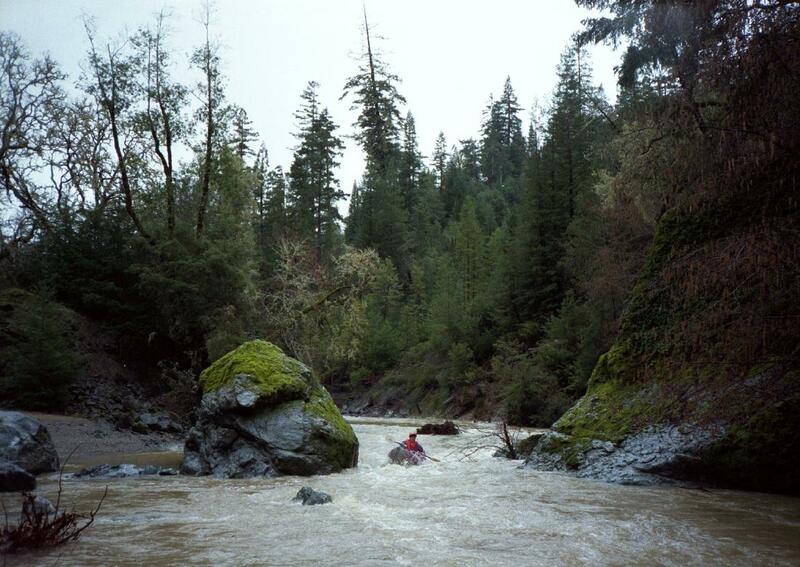 The average gradient is slightly less than 30 feet per mile and the hardest rapids are slightly lower than class III. There are, however, many consecutive miles of class II and II+. This is a remotely populated section of the state and you can expect a great run in a wilderness setting. The scenery ranges from narrow gorges to second-growth redwoods, to open valleys with rolling hills. You can only run Rancheria during the rainy season, usually from about January into March. Rancheria does tend to be runnable (at least by kayaks) well after many other creeks have dropped to unrunnable levels because it drains a relatively large area. It is, of course, best after a recent rain. The lower run, from Mountain View Road outside of Boonville to Hendy Woods State Park near Philo, is by far the most popular. 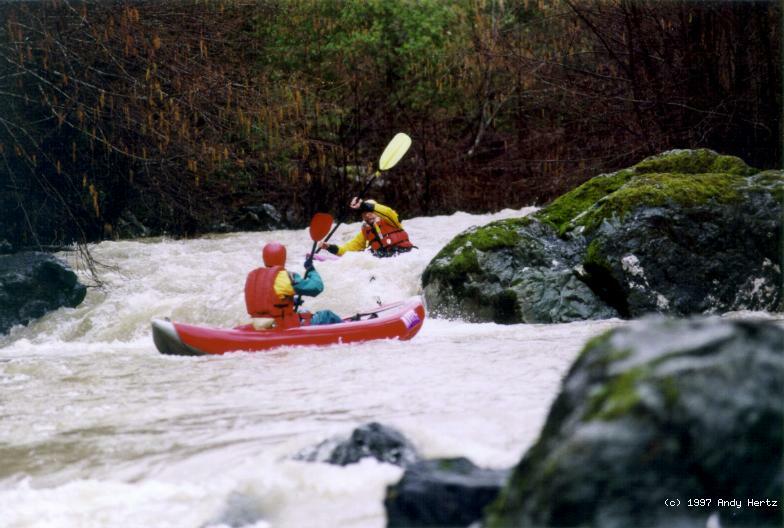 It is described in California Whitewater by Cassidy and Calhoun. On any given winter weekend, a dozen or more people can be seen running this fifteen mile section. It is one of the nicest easy wilderness runs in the state. The upper run consists of the thirteen miles from Fish Rock Road near Yorkville to Mountain View Road. It is much less popular. 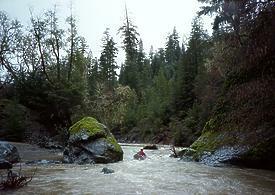 The hardest rapids are a bit harder, it contains more flatwater, and redwood groves are scarcer. Since it is nearer the headwaters, you can expect less water than the lower run has. Also, you can expect two to four times as much water at the end of the run as you have at the put-in. The put-in is on river right just above the Fish Rock Road bridge near its intersection with Highway 128. You can walk the boats down a dirt road right to the river's edge. The first five miles follow the relatively narrow canyon near Highway 128. You can see much of this first section from the road. 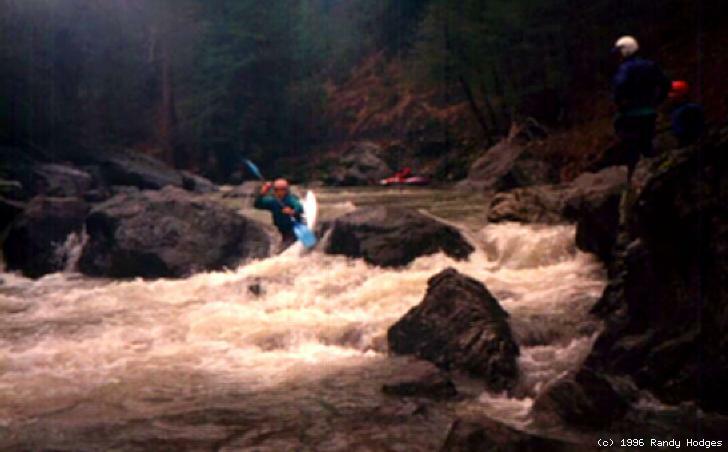 There are many fun class II+ rapids and perhaps one that rates a bit higher than that in this section. There is also a strongly recommended portage thru a major strainer near mile three. This portage is just below a suspended pedestrian bridge. Several other sections have sharp rocks and relatively narrow passages thru rocks and willows in the stream bed. After mile five, the creek heads south-west away from the road. The next eight miles is very remote and wild. The gradient is pretty much continuous (probably 30 feet per mile or so) until about the last three or four miles of the run. There are several long gorges with continuous II and II+ rapids in this section. The river is bigger by this time and the passages are a bit easier than they are higher on the creek. There are many side-streams cascading into the water all along this section as the river continuously gains volume. We felt that the toughest rapid was near mile seven or eight when the river dropped over a narrow chute into a two-foot fall. If you are too far right, there is a nasty sharp exposed rock at the bottom. One of our party lost control of his kayak just above this fall and watched it disappear under a rock on river right just above this fall. It did not come out the other end and no trace of it was visible. Luckily, we had a rope in one of the other boats. We were able to extricate it without too much trouble. It is a bit unsettling to realize that a person could have as easily been sucked under the rock. The remaining five miles were uneventful and stunningly beautiful. It is amazing that there is country this lovely in this state with virtually no one living in it. If not for the cows and occasional fence, you could easily imagine what the early explorers must have felt like as they first paddled the streams of this state. The most amazing sight is near mile 10 or 11 where a manzanita bush is growing out of the top of a redwood stump about ten feet above the stream. It is hard to imagine how it can find the soil and moisture to grow is such an improbable place. The take-out is below the Mountain View Road Bridge. We have found it easiest to run a rope to the bottom of the slippery slope and pull-up the boats. The shuttle is almost an hour long.